It is no secret that truck drivers love music. Music is often the only company along those lonely of empty highway. Arguably some of the most favorite musical artists for truckers are those singers who are or have been truck drivers themselves. So let me introduce to you, truck driver, guitarist, and lead singer of The Taylor Barker Band – Mr. Taylor Barker himself. Some of you who have attended truck shows like the Mid-America Truck Show in the past may recognize Taylor from his performances with fellow trucker and singer, Bill Weaver. What you may not know is that Taylor has his own band. The Taylor Barker Band has been a mainstay in many local venues across Tennessee for the past 20 years. He has even opened for groups like Jenna Cramer and the News Boys, Matt Stillwell, Brad Puckett, and The Band Perry. Taylor helped a young Brad Puckett early on in Brad's career by offering him a weekly gig at a hotel bar Taylor managed. Then, as fate would have it, Brad, after hearing Taylor playing "Unanswered Prayers" by Garth Brooks, pushed Taylor to persue his own career in music. That “why” is the love of helping people, of bringing smiles to faces in the crowd, and of being a positive role-model and inspiration for those who may need it. Taylor and his band started playing one night a week as the house band for the local Moose Lodge, usually to crowds of 20-25 people. The size of the crowd didn't matter, it was sharing their love of music with others. As their popularity and crowds grew, so did Taylor's charitable efforts. 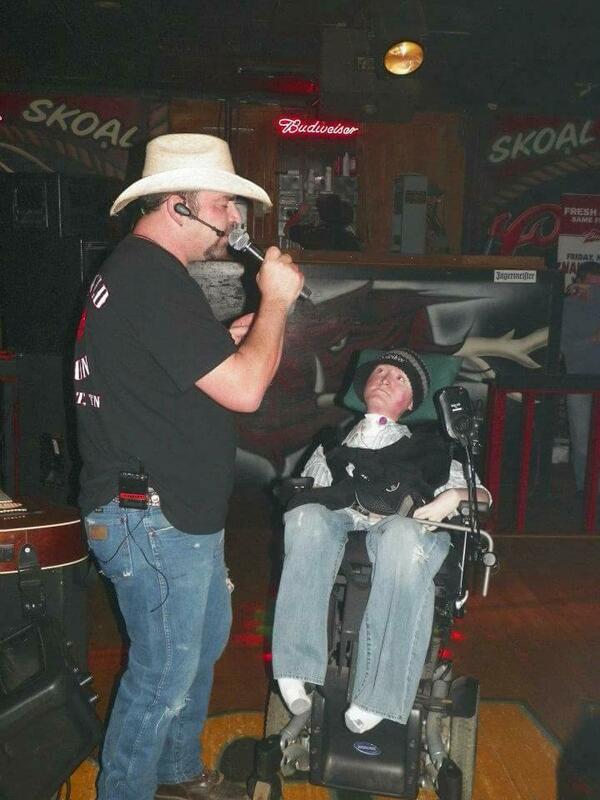 Over the years The Taylor Barker Band has raised over $100,000 for various charities. He jokes that The Taylor Barker Band “sells bars out of beer,” which has actually happened! Taylor spent 10 years in the Army National Guard. So, you can always find him ready to lend a helping hand with it comes to our nation's hero's, from military to truck drivers. He recalls a charity event where in one night alone, his band raised $13,000 for The Wounded Warrior Project. In the past year he has donated his time and music to help raise money for charities such as truckersfinalmile.org, St. Christopher's Fund, and to help local families in need. Taylor Barker and his beautiful wife, Cherie. When he is not trucking or performing, Taylor also works with his beautiful wife, Cherie, on their newest business venture, Cherie's Boutique, a Tennessee local boutique that among other things features custom handmade furniture. Cherie manages the store, refurbishes furniture and antiques, and makes many of the items sold in the store. Taylor spends his days off making furniture both for the store and custom pieces for clients such as Joe Diffie and the late Daryle Singletary. Whether it is trucking, music, or his hand-made furniture, Taylor's passion shines through. It is this passion for creating and entertaining that drives Taylor. If you ever have the chance to catch him perform live, whether sharing the stage with other musicians or leading his own band, take the time to stop and listen. His love for music and making people smile radiates from inside him and you can't help but smile along. Anybody that knows Taylor, knows he is a goofball! That is one of the reasons we all love him so much.